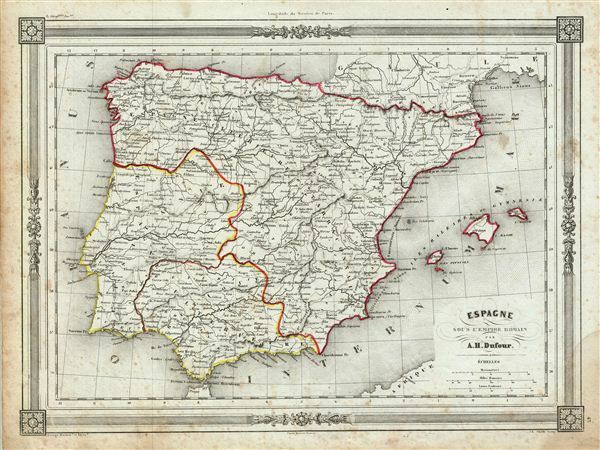 An uncommon and extremely attractive 1852 map of Spain under the Roman empire. The map covers all of Iberia under the Roman Republic from the Atlantic Ocean to the Mediterranean Sea. This includes Hispanic Citerior or Tarraconensis, consisting of the Baetica and Lusitania. Includes the Balearic Islands. Throughout, the map identifies various cities, towns, rivers and assortment of additional topographical details. Although the Romans controlled most of the Iberian Peninsula from about 218 BCe, it took them close to two centuries to fully subjugate the region. The map features a beautiful frame style border. Prepared by A. H. Dufour for publication as plate no. 43 in Maison Basset's 1852 edition of Atlas Illustre Destine a l'enseignement de la Geographie elementaire.